(Newser) – If riding an enormous sugar high can help you start to see unicorns, Starbucks' new Unicorn Frappuccino is your ticket to a world of magic. Otherwise, it's likely just the fast track to an insulin therapy regimen. The limited-edition drink—which the Washington Post snarks tastes like "sour birthday cake and shame," while the Federalist labels it "an abomination"—may be spurring plenty of Instagram posts during its five-day run through Sunday, but its ingredients list is what's really raising eyebrows, BuzzFeed notes. 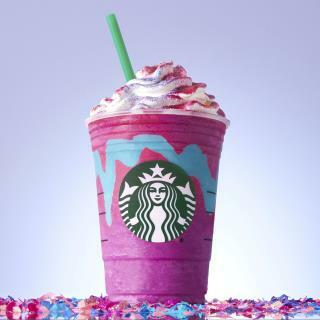 The concoction, which changes colors and flavors as it's mixed, contains whole milk, whipped cream, a variety of flavored syrups, and blue and pink "fairy powders" sprinkled on top—all of which serves up 59 grams of sugar in the Grande (16-ounce) version. Over priced coffee and always has been. More then gallon of gas. The old saying a sucker is born every day to pay that much for coffee and they worry how to pay their rent. I was wondering why it tasted sweet, must be from the sugar it it.